When I first moved to Israel I avoided going to the Syrian border of the Golan Heights in Northern Israel. I was afraid that somehow I’d be ambushed in the war or hit by a missile from the East. Today, it has become a favorite destination and I visit the area regularly. The North of Israel is pristine in its beauty. Because of the upper elevation, it is cooler and more verdant, an area rich with orchards, vineyards, volcanic mountains, and sweeping savannahs where cattle graze and horses run free. There are waterfalls, great hiking trails, ancient ruins (Nimrod’s Fortress, Agrippa’s palace, Roman cities, old synagogues and monasteries). 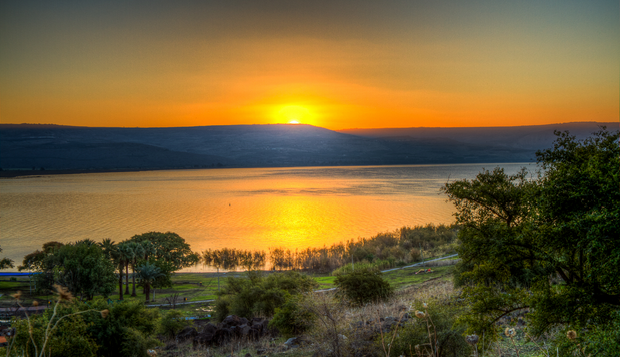 A popular destination for both international tourism and Israelis escaping the cities and heat of the South, the Golan has abundant tsimmerim (resort cabins). There are day spas and wineries; fabulous meat restaurants; whiskey distilleries, boutique wineries and artisanal beer brewers and cheese makers. Recently, I’ve been going to the Golan to pick fresh organic fruit for my business, Tamar Gourmet. Last month, we went to Kibbutz El Rom because they had fresh cherries to be picked. And were we in for a delightful surprise!!! Kibbutz El Rom is quite tiny. It was founded in 1971 by a group of soldiers who had finished their army service and by families who moved from the center of Israel who wanted to enjoy more space and natural beauty. The 70 families who now live there are mostly farmers and ranchers, but their main subsistence is – wait for it – the movie industry! All the latest films from Hollywood are sent to El Rom to be dubbed or subtitled from English to Hebrew. They have a small theater there that shows films to the residents of the Golan in the evenings. This hidden gem is also home to a museum commemorating the Battle of Emek HaBekaa, the Valley of Tears, which took place during the 1973 Yom Kippur War. The Syrian army launched a surprise attack with fighter jets and 1270 tanks against less than 75 Israeli tanks. The bulk of the fighting was done in the fields adjacent to the kibbutz, with a valiant Israeli fighting force and a mere 6 tanks which held off the entire Syrian force quite miraculously. There is a film that is shown there during the day. Interviews with the surviving commanders, live footage, and computer generated maps of the battlefield bring the story to life. After visiting the kibbutz, we trekked to the valley, and the precipice of Mount Hermonit overlooking Syria about a mile away. Besides the static tank displays, we were in disbelief to actually watch the Syrian army bombing the town of Quneitra below. We could see the smoke from the fires on the outskirts of the town and hear the gunfire and explosions. It was quite sobering, yet from our vantage point, we knew we were safe. The guys were undaunted, having fun climbing on the old Israeli and Syrian tanks and watching the battle below us. It was all quite surreal. Later, we would hear that the rebel forces had been overrun and the area adjacent the Golan in Syria was under Assad’s control. After picking our cherries nearby, we made our way to a couple local wine cellars. Driving through the Heights was a bit daunting when we first visited years back. On either side of the roads are signs to keep out of the fields which had been mined by the Syrians pre-1967. Mine fields sit relatively undisturbed next to fruit orchards and farmers plowing their fields. Occasionally a stray cattle will wander in and become tomorrow’s hamburger (true, but typical humor for us). There are numerous army bases in the area, so we also have signs for tank crossing, something you’ll see in few other places. It’s kind of exciting in a way… but on to the wines – Odem Mountain and Ortal are two good ones. And of course, a hearty steak at HaBokrim, a cowboy ranch and resort hotel right on the border at Merom ha Golan. It’s idyllic setting belies the reality only a couple miles to the East. Last week, my girlfriend and I went back up to the Upper Golan for a special field trip. Another pleasant surprise, we decided to visit Kibbutz Ein Zivan, a mile from the Syrian border at the foot of Mount Avital. It was a peaceful day and perfect in every way. The kibbutz was started in 1968 by youths from other kibbutzim in the area, and Garinei Nahal, soldiers who lived on the kibbutz, lending a helping hand to build homes and who were there for protection. Today, the small kibbutz has about 45 families, but beautiful new single family homes are being built there. Ein Zivan is set amid spreading oak and sycamore trees. There are orchards adjacent brimming with pears, apples and stone fruit; blackberry, gooseberry and raspberry brambles; sprawling vineyards; a riding stable; beautiful American-style guest cottages…. and the artisans!!! Hadassah and I headed to de Karina Chocolate Factory, a boutique atelier started in 2006. Karina and Gyora Chepelinski immigrated to Ein Zivan from Argentina. Karina comes from a long line of world famous chocolatiers who moved from Vienna to Argentina before World War II. So, making confections runs in her blood. We took a tour of the factory which included a film, a hands on workshop, a sample box and discounts to the store. Karina was there overseeing all the operations and speaking to the many guests. I was amazed at the crowds! After our chocolate and brownies lunch, we went next door to Bahat Winery. In typical Israeli fashion, we were greeted by the vintner himself, Oder Bahat, who cheerfully took us on a tour of his processing room, barrel-lined wine cellar and distillery. Such A treat… we got to taste ample pourings of each of his red wines and then sample his delicious liquors. The chocolate cherry liquor was amazing and I’ll be sure to use it on ice cream and in a reduction for sautéed livers. Next on the agenda was the Mizze workshop and store selling hand crafted jewelry. All of the necklaces, bracelets and earrings are blessings and good luck charms. The artists also use ancient coins found in the area. Their work is unique and lovely, but pricey. My favorite find of the day was the studio of the beautiful Yael Arnon. Yael immigrated with her family from France when she was a little girl. Her parents were French Algerians, and her mom was a seamstress. Yael never sewed until after her own daughters were grown and had moved on. She found her late mother’s sewing box, and a new journey began for her. Today, Yael has her own studio filled to the brim with her marvelous and creative inventions. She and her husband spent several years in India where she fell in love with and collected fabrics. Yael sells pillows, handbags, wall hangings, toys and other fanciful whimsies using materials from all over the world. I honestly don’t know what is more wonderful: visiting all of these interesting places or meeting the people ( Israelis can be the warmest, most hospitable folk) and making new friends. The afternoon was spent blackberry picking and we took in a quick visit to the border. The afternoon was eerily quiet. All peaceful on the Eastern front. Which is a very, very good thing. Of those that are left, most are quite small. Many have sold off their land for development into moshavim and yishuvim. Only 4 are still strictly communal living, I believe. It worked for the beginning when Israel was first being established and all hands were needed for building, agriculture, defense against marauding Arab tribes. There was little to go around, all was shared. A story for another blog, but in a nutshell, the “grand communist ideal” flopped or fell into disuse for many reasons. You have a gift, Tamar, of seeing all the beauty of an area! Thanks Tamar. I love your prose and description of this lovely land. Thanks Tamar. The wine and chocolate sound great. I loved the pictures. May G-d bless the people of Israel. Very nice post, so much good in Israel. Just wondering, is the last photo a fixer-upper just waiting for someone’s magic touch? I can just see you removing those weeds and starting a compost pile and veggie garden, painting, and installing new windows and doors.And then all the fun you could have decorating inside. Well, just a thought. Ha! I took several pictures of these bombed out barracks. There is a group of them left over from the wars. They lie right on the border(literally). Some say they are used to store farm equipment; I’ve also heard apple storehouses, as there are fruit orchards right up to the edge of the border. Makes for good photos, but a little too close to the action for my comfort. Did you visit de Karina on your trip? Did you all go to Coffee Anan (ha!) the UN hangout atop Mt Bental that overlooks Syria?